Eleanor Sauerwine, 74, passed away with her family by her side on January 23, 2018. She is survived by her husband of 51 years, Bill Sauerwine of Winter Garden, FL; her daughter Debbie and her husband Jason Robinson, also of Winter Garden, FL; grandson Zachary Robinson; sister Janet and her husband Bill Jester of Raleigh, NC; and many nieces, nephews, cousins, and beloved family and friends. 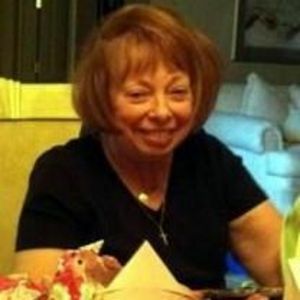 Eleanor was preceded in death by her parents, Jim and Eleanor Wesseling, of Philadelphia, PA. She was a devoted and loving wife, mother, grandmother, and friend to many. Friends and family are invited to attend her funeral services on Monday, January 29th with a visitation beginning at 10 AM, followed by a service at 11 AM at Presbyterian Church of the Lakes, 4700 Lincoln Avenue, Orlando, FL 32819. Interment will immediately follow the service at Woodlawn Memorial Park, Gotha FL. In lieu of flowers, the family respectfully requests donations be made in Eleanor's memory to Lord of Life Lutheran Church, 1 Winchester Court, Tabernacle, NJ 08088.